Our recent “Future of CIL” event ended with an almost unanimous show of hands in support of the question as to whether the audience thought we should tackle some form of land value capture system. 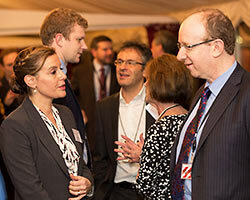 It was a very telling ending to an event entitled the “Future of CIL” with the CIL Review Chair, Liz Peace CBE. The idea of CIL was, of course, that there would be a simple mechanism for levying a charge on all development, with no exceptions. Developers would know in advance of the fixed sum they had to contribute towards funding infrastructure and Local Authorities would have more money to fund it. Indeed, a fair and transparent method of land value capture from planning permissions. In theory this sounded like a good idea. In practice however, as one of our audience members eloquently pointed out “CIL has been remarkably unfocused and simply an irritant”. Since the CIL system began in 2010 there have been amendments and technical changes nearly every year, huge disparities in take up and a general disappointment as to the revenues raised from it. In fact, as Liz Peace highlighted, a whole new industry was created around “working the CIL system”. It is no wonder that the Government commissioned a review. 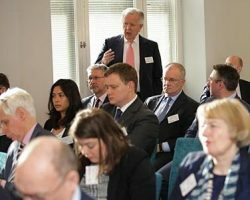 Whilst the discussion in the room focused on several elements of the identified remaining challenges of CIL, the audience was particularly interested in two aspects. Liz Peace felt that the Neighbourhood share allocated to Parish Councils (15%/25% of CIL receipts depending on whether a Neighbourhood plan was in place) was a “disaster” – taking away much needed funds for Local Authority priority infrastructure projects and for purposes that were often unclear. Indeed, I myself was asked at a recent meeting with a Shire Town Council (in an area with ongoing major development projects) as to whether they could use their portion for a flat for the Town clerk as they had few other ideas. One member of the audience felt that a generous Neighbourhood share would perhaps make development more acceptable to communities. But our Chair (Celina Colquhoun, a senior barrister from No5 Chambers) pointed out that, from her experience, communities “will not be bribed”. Indeed, one London Planning Department head in the audience explained how, having just done their first round of neighbourhood allocations (which varied from new seats by a bus stop to sound proofing a music room) “probably” did not make Development in her area any more acceptable to her residents. From the Developers in the room there was a clear message. The point was made that if the Government wanted to encourage development and help smaller housebuilders then the Review should have looked at how s.106 was a legitimate charge to mitigate the impact of development. CIL however, yet again, increased the costs of new development and was thus a disincentive. 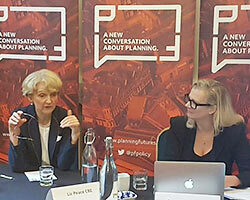 Liz Peace felt that there must be a system that pays for whatever is needed to mitigate Development– a mechanism that is solely there for that, which a Developer pays and the Local Authority spends. She explained further that s106 got stretched and stretched and actually needed to be pulled back to what the legislation intended – a sum mitigating Development. One further point raised by a London Borough senior officer, was that there was a difference between mitigation of development in policy terms and in voters’ eyes. The impact of development – pressures on schools and roads etc.- can be seen as both negative and positive. The problem was actually that monies were needed upfront in the planning stage of the Development to be seen “mitigate” from the start. 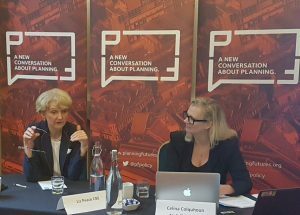 Liz Peace agreed that the issue of Local Authority borrowing was one that needed to be explored further (and pointed out that borrowing against CIL revenue was in the regulations but had never been enacted). And what was the Government reaction to the review recommendations? According to Liz – very little. February’s Housing white paper announced that a statement on the reform of CIL would be made in the budget on 22nd November. So, we will just have to wait a little longer. But whatever comes out from that budget, the Review author and our audience were clear – What is needed is something more radical – something that really and effectively deals with land value capture. 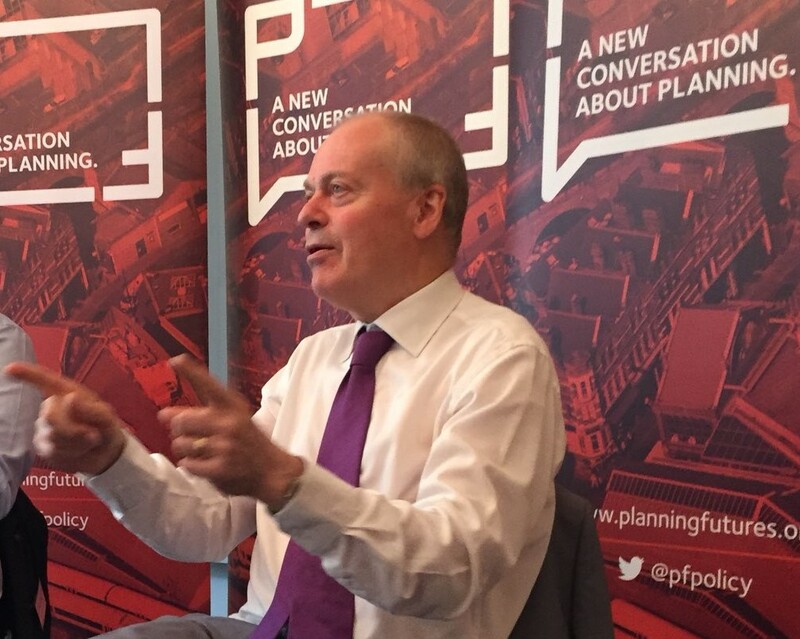 Planning Futures will seek to find answers to that conundrum next year. Many thanks to our event chair, Celina Colquhoun (No5 Chambers), and to our speaker, Liz Peace. The audience comprised of a specially selected group of sector stakeholders including Local Authority members and officers, planning consultants, developers and land owners. Cian is passionate about all things planning. In 2013 he gained an MSC in International planning from the Bartlett School of Planning at UCL. Over the past four years he has held a number of research positions and has written on a range of subjects within politics and planning. 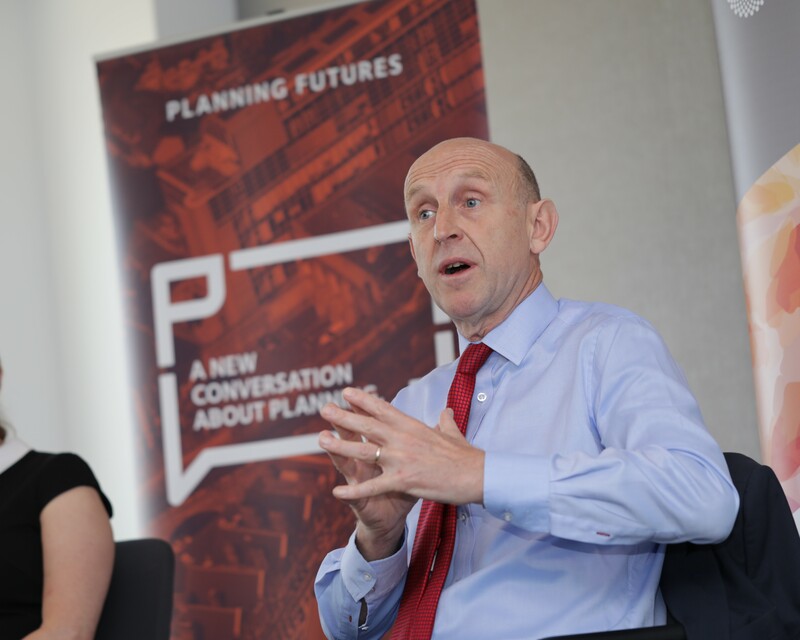 In 2015, Cian became a Founding Director of Planning Futures in order to promote better planning policies and an improved planning system. He recently authored the first report from Planning Futures entitled Outer London Town Centres: A New Approach. He is currently working on our forward research programme, which includes our new Local Government Series: Policy & Process. 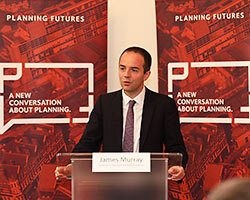 He regularly writes on the Planning Futures blog, which is available on our website. Cian is particularly interested in the governance issues surrounding the planning process and in topics such as community planning and mega infrastructure delivery. In addition to his planning interests, he has a keen interest in Politics and Governance issues and holds a master’s degree in Political Science and Sociology from the National University of Ireland, Galway. Housing and Planning issues have been at the heart of Hannah’s Career for two decades. Hannah’s experience straddles both the public and private sectors. As a former local Councillor, Cabinet Member for Housing and Planning and Chair of a Local Borough Planning Committee Hannah understands the challenges faced by Local Authorities in developing planning policies that work for the community. As a former Property Solicitor, she also has key insights into the housing market from a commercial perspective. Hannah has an MSc in Spatial Planning from the Bartlett School of Planning at UCL. In 2015, Hannah became a founding director of planning futures. She is passionate about improving the planning system and promoting planning as means of delivering positive social change. Andrew Taylor is Director (Head of Planning) at Countryside Properties and leads the company’s strategic planning function. Before joining Countryside, Andrew was Head of Planning at Barratt Homes Eastern Counties and prior to that spent over 18 years in planning authorities in the south east of England. He has experience of both urban and rural planning from small scale exception needs housing to master planning new settlements, major town centre redevelopments and international airport expansion. Andrew chaired the RTPI Board of Trustees for 4 years to December 2016 and helped steer the Institute through probably its most challenging period in recent years. As a result, the Institute dealt successfully with financial pressures, a change of governance and Chief Executive, the need to sustain Planning Aid and responded effectively to the ever present challenge of government changes. Andrew took on the role of Hon. Treasurer in January 2017 and continues on the RTPI’s General Assembly. 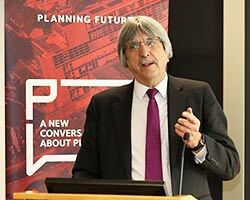 Andrew is a member of the Leeds Beckett University Partnership Board and the Chair of The Nationa Planning Forum’s Management Committee, championing planning and inspiring all those involved in the planning process and in delivering the new planning agenda. The Royal Institute of British Architects champions better buildings, communities and the environment through architecture and their 40,000 members. They provide the standards, training, support and recognition that put their members – in the UK and overseas. Anna Rose is an architect and urban planner with particular expertise in developing and advising on mixeduse masterplans around transport interchanges. Trained in Aachen and London, she joined Space Syntax in 2002, becoming a partner and board director in 2007. In addition to her work in the UK, Anna leads the company’s design and consulting activities in the USA and continental Europe. She speaks regularly at industry and academic events worldwide and is an Honorary Senior Research Fellow at University College London. Anna is a member of the UK Academy of Urbanism. Anna has extensive experience in advising both private and public sector clients on large and complex masterplanning projects, with a particular focus on the design of effective human behaviour patterns and public realm design. Her expertise targets the optimisation of spatial connectivity for the benefit of pedestrians, cyclists (walkability, safety and conviviality) and local businesses (proximity to footfall, interchange and density of amenity). Brian Robson is Policy and Research Programme Manager at the Joseph Rowntree Foundation (JRF) where he leads JRF’s Housing and Poverty programme. 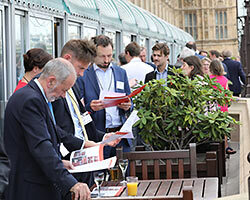 The programme aims to set out policy and practice approaches to enable more effective housing responses for those living in poverty in the UK. Before joining JRF in February 2015, Brian worked in policy roles at the Northern Housing Consortium and National Housing Federation. His career in housing began at a large London housing association and included spells working in housing management, stock transfer and service improvement. Brian has an MA in Regional Development and Spatial Planning from Newcastle University. Steve Norris was a Member of Parliament for 14 years and for almost five was Minister for Transport with a special responsibility for London. He was twice his party’s candidate for Mayor and has served as a board member of TfL and the London Development Agency. He is currently Chairman of BNP Paribas Real Estate, of Soho Estates, Virtus Data Centres and London Resort Company Holdings the developers of London Paramount the £3bn entertainment resort in North Kent which is the first commercial Nationally Significant Infrastructure Project (NSIP). He has an MA(Hons) from Oxford in Jurisprudence is Chair of the Council of the National Infrastructure Planning Association and a Fellow of the Royal Institution of Chartered Surveyors. He has written for Property Week for many years. Janice Morphet is a Visiting Professor in the Bartlett School of Planning at University College London, and was on the Planning Committee of the London 2012 Olympic Games. She was a Senior Adviser on local government at DCLG 2000-2005, having been Chief Executive of Rutland CC, Director of Technical Services at Woking, and Professorial Head of the School of Planning and Landscape at Birmingham Polytechnic. Janice has been a trustee of the RTPI and TCPA and held several roles at the RTPI including Chair of Education and Life Long Learning Committee and the London Chapter. Janice has also been included in Planning’s Power 100 list of planners. Janice has been researching both infrastructure planning and delivery and state rescaling. Janice has written frequently for Planning and her recent books are Modern Local Government (2008) and Effective Practice in Spatial Planning (2010) How Europe Shapes British Public Policy (2013) and Applying leadership and management in planning: theory and practice (2015). Her next book is Infrastructure delivery planning: an effective practice approach (2016). Michael Lowndes is Executive Director at Turley, where he specialises in the advocacy of design-led schemes and works at the interface of planning, urban design, heritage and community engagement. He has over 30 years of experience working on complex planning and masterplanning proposals across London. Michael sits on Turley’s Board, is an Non-Executive Director of Design for Homes and is a judge for the DCLG Housing Design Awards programme. He provides expert evidence and has lectured widely on technical and professional matters. Michael started his planning career at LB. Bromley, working subsequently for LB. Hackney, the City of Westminster and TP Bennett. Stephen Hammond read economics at Queen Mary’s College, London, before starting work as a fund manager for Newton Investment Management. He later worked Canada Life, before moving on to a series of investment banks, including Philips and Drew and Dresdner Kleinwort Benson, where he became director of the equities division in 1991. Stephen joined Commerzbank in 1995 and later became director of pan-European research. He left the job in 2003 to concentrate on his political career..
Stephen served for four years on Merton Council, where he was his party’s environment spokesman and deputy leader of the Conservative group until he stood down a year after his election to Parliament. He has been the Conservative MP for Wimbledon since 2005. His policy interests include health, financial affairs, transport and foreign affairs. From 2010 to 2015 he served as Shadow Minister for Transport and from 2012 to 2014 he was Parliamentary Under-Secretary of State for Transport. Stephen is now a member of the Treasury Select Committee. He is an associate of the Society of Investment Analysts. Richard Harwood OBE QC is a leading planning barrister at 39 Essex Chambers and acts for developers, public authorities and interest groups. A case editor of the Journal of Planning and Environment Law, Richard is the author of several books on planning law. He was appointed Queen’s Counsel in 2013 and awarded an OBE in 2014 for services to planning and environment law decision making. Stephen Greenhalgh was appointed Deputy Mayor for Policing and Crime (DMPC) by Mayor of London, Boris Johnson, in June 2012 and served until May 2016. He was the executive lead for MOPAC and as DMPC, exercised the powers afforded to elected Police & Crime Commissioners outside the capital. He framed the 20-20-20 Challenge for the Met Police which formed the basis of the Mayor’s strategy outlined in the Police and Crime Plan – to cut key neighbourhood crimes by 20%, to boost confidence by 20%, whilst cutting costs by 20%. Stephen was previously Leader of Hammersmith & Fulham Council from 2006 to the end of May 2012. During his Leadership, Stephen set up the first H&F Home Buy unit, saw Imperial Wharf and Shepherds Bush Stations built on the West London Line and many major regeneration schemes approved in Imperial Wharf, Earls Court, White City and Old Oak. 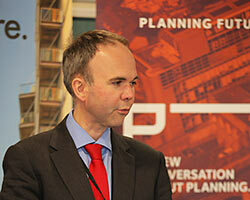 Richard Blyth has been Head of Policy and Practice at the RTPI since September 2011. 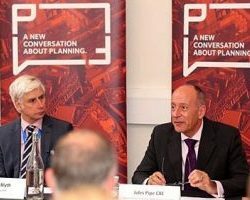 Since then he has established the RTPI’s new policy paper series starting with Housing in 2013 and also the special RTPI Centenary Planning Horizons research programme with 5 projects being published in 2014. Victoria Bankes-Price joined the Woodland Trust in 2011 and leads the Trust’s work on national planning policy. Her remit at the Trust is very broad but focuses on ensuring that the Trust uses the planning system to its best advantage to protect and promote woods and trees. Victoria is a chartered member of the Royal Town Planning Institute and the founding and past chair of the East Midlands Young Planners. She currently chairs the ‘Link Wildlife and Countryside Land Use Planning Group’ bringing together planning professionals from a wide range of environmental voluntary organisations. Victoria started her career at Yorkshire Forward (RDA) before spending time in both the private and public sectors. Ruth Cadbury is a Labour MP, elected in 2015 for Brentford & Isleworth in west London. Prior to that she was a senior Councillor at LB Hounslow as a Cabinet member or committee chair with a number of responsibilities over the years including; Regeneration, Planning, Children’s Services, Financial Inclusion, Housing and Equalities. She was also involved in Local Government bodies including the LGA, London Councils, and before the creation of the London Assembly, was Hounslow’s representative on the London Planning Advisory Committee. Professionally Ruth worked at Covent Garden Community Association, and as a town planner at Planning Aid for London and then the London Borough of Richmond upon Thames. She also provided consultancy services for Sustrans and the Local Government leadership training scheme. In Parliament Ruth co-Chair’s the All Party Parliamentary Cycling Group, and a member of the Women and Equalities Select Committee. Daniel Finkelstein, OBE, is the Associate Editor, a Columnist and Leader Writer for The Times. He also sits in the House of Lords as Lord Finkelstein. As well as his weekly political column in the comment section and his Saturday Notebook, he writes the “Fink Tank” for the Saturday paper, a statistical column on football. Between 1997 and 2001, he was chief policy adviser to the Leader of the Opposition Rt. Hon. William Hague MP and Secretary to the Shadow Cabinet. In 2001, he was Conservative parliamentary candidate in Harrow West. Between 1995 and 1997, he was Director of the Conservative Research Department in which capacity he advised Prime Minister John Major and attended meetings of the Cabinet when it sat in political session. Daniel was awarded an honorary Doctor of Science by the City University and joined the House of Lords in the autumn of 2013.